Snowden, what were you thinking? 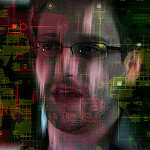 When The Snowden Revelations first broke in late May 2013, I couldn't help but notice his date of birth: June 21, 1983. A mere 20 days away from my own. Which means that we were both of us in the messy process of turning 30 when it happened. "Do nothing from selfish ambition or conceit..." (Philippians 2:3a). Eek. Have I ever done anything, good or bad, however miniscule, that didn't undershoot this exhortation? [Thumbnail image cc from AK Rockefeller on Flickr].